This is a standard replacement flash tube for the Quantum T2 flash head. Most current, professional flash heads and monolights are equipped with user replaceable flashtubes that may simply be plugged into, and unplugged from their sockets. With proper handling, these flashtubes may last for tens of thousands of flashes under normal use. 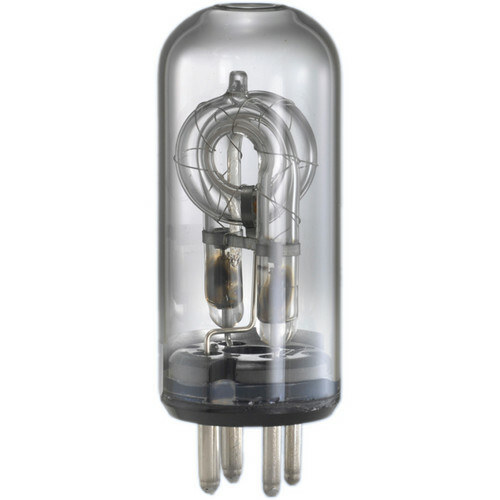 Box Dimensions (LxWxH) 5.7 x 2.3 x 2.3"
QF30 Flashtube is rated 4.9 out of 5 by 34. Rated 5 out of 5 by Saffron Photo from Easy to install After almost 7 years of abuse my QFlash came crashing to the ground and the bulb broke. I wonder how many more pops I could have gotten out of it? The least expensive replacement bulb was found at B&H and it merely required a quick twist and pull to remove the old and push and twist to install the new. Rated 5 out of 5 by Lady In Pink Photo from Lighting My World I have a Q Flash Model T5D-R and these lights are easy to install, do not heat up, and produce this wonderful light that evenly falls on my subjects. I do not have an accurate knowledge of how long they last, I have only had 10 photo-sessions with this bad boy, I'll eventually let you know when it burns out or breaks. Rated 4 out of 5 by Cool Water from Insurance that doesn't require a policy. I've been a photographer since 1981 and I shoot everything from magazine stories, weddings, grand openings, wildlife, scenic and I always use a Quantum over my SB800. I would give the QF30 bulb 5 stars if it were $35, but if you are a photographer for hire you have to have a spare. The bulbs last a very long time, but are breakable. If shooting film consider the QF30UV but with digital it is simple to color correct in post. Rated 5 out of 5 by Scott from Thank God for parts! I dropped my Quantum flash at a wedding and it would not flash--good thing I had a back up! This is my go-to flash for weddings and a must-have for my work. I was glad to find this Flashtube available when I started to research how to fix my Quantum. I ordered this and replaced the Flashtube, and it now works fine. Phew! I was happy not to have to buy a $1000 flash. Rated 5 out of 5 by CARedHair from great product - the bulb is for emergenc I purchased the Quantum Trio for my Canon camera and I have never been happier. I just fear that with all the use I get, the bulb will burn out in the middle of a wedding or important event... so I purchased this spare bulb. I had no need to use it yet so I have not tested it but knowing the QFlash quality, I know I am in for a quality product. Rated 5 out of 5 by Steve from Quick reliable service I have the Quantum Qflash Trio unit. Am very happy with it as it's reliable and consistant with it's results. I simply wanted a back up bulb for my unit just in case something happened, I would have a backup. I ordered from B&H Photo whom I've used over the years. They are fast, reliable and have the best prices... very happy with them. Rated 5 out of 5 by The Photowiz from Great bulb As indicated, I use this bulb with my Quantum T2 flash head. I had used the same tube for over 15 years until I dropped the head and shattered the original bulb. This was a replacement and I was able to pick up right were I left off. There has been no difference in color quality or output. Great bulb. Great system. Rated 4 out of 5 by Anonymous from Works good as far as bulbs go its good and works like its suppose to. The price on the other hand I could do with it being a bit lower, that being said it is pretty durable. Ive had my quantum fall a couple times and usually the light doesn't break and if it does only the outer glass does leaving the filament good to go. QUANTUM QF-30 ( UV) OR QF30 FLASHTUBE FOR INDOOR FLASH? You would use the UV coated QF30UV bulb if the assignment is to photograph a bride in her white wedding dress. The UV bulb will produce a warmer temperature light resulting in a more natural white colour of her dress rather than adding a blue tint to it. Therefore, less colour correction in post processing if you want her dress to be white.